Mason Buttle doesn’t exactly “fit in.” He’s bigger and sweatier than any of the other kids in his class. His family’s home, with its orchard, has slowly been deteriorating after the Buttles endured some personal tragedies. And Mason recently lost his best friend, Benny, to a terrible accident that occurred on the Buttle orchard. Only Lieutenant Baird doesn’t believe it was an accident. He thinks there is more to the story than Mason is telling. Due to the personal and financial hardships faced by the Buttles over the last few years, Mason’s Uncle Drum sells off portions of the family orchard to developers. Unfortunately for Mason, along with the new houses that crop up, come neighborhood bullies. Several of the new boys pick on Mason: at school, on the bus, and at home. But his classmates aren’t the only bullies. Lieutenant Baird regularly shows up at the Buttle home, prodding Mason to provide him with more information on Benny Kilmartin’s death. He is certain Mason is hiding something. Lieutenant Baird even gives Mason a notebook where he can write all of his memories about the incident. Only Mason isn’t hiding anything. And the stress of the situation, combined with his dyslexia has left him unable to do anything with the Lieutenant’s notebook. Finally Mason’s luck turns. A new kid in town, Calvin Chumsky, quickly becomes his new best friend. The two boys become inseparable. They dodge the neighborhood bullies together, and spend afternoons afterschool at Mason’s home. That is, until Calvin goes missing. And the last person to see him was Mason. As the search for Calvin gets underway, the whole town, especially Lieutenant Bard, is eyeing Mason. 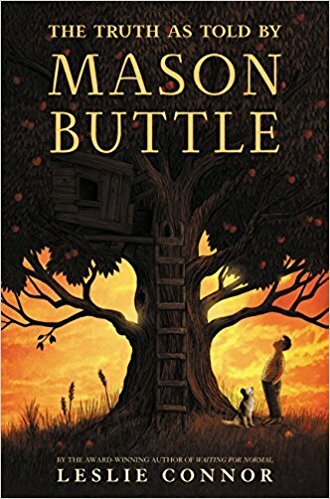 I LOVED The Truth as Told by Mason Buttle. Mason is a supremely loveable character. He is earnest and optimistic. Despite a multitude of obstacles and unfortunate events in his life, he continues to be a good, kind person with a positive outlook. Author Connor does an amazing job of featuring a character who is outside the mainstream, without making that the biggest part of Mason’s story. I really enjoyed that book was mainly a well-written piece of realistic fiction, that also had this mystery slowly unraveling in the background. And then two mysteries! I would highly recommend to readers who enjoy realistic fiction and mysteries. And anyone who appreciates quirky characters. At a French inn, in 1242, several guests who have gathered share tales of the adventures of three remarkable French children and their dog. The children: William, a young monk with unnatural strength; Jacob, a Jewish boy with the power to heal extraordinary wounds; Jeanne, a peasant girl who has visions of the future; and Gwenforte, Jeanne’s dog who has risen from the dead; are believed to be saints due to their spectacular deeds. They have also been declared the most wanted fugitives in France by King Louis IX. One of the guests at the inn inquires about the children and their story to find out where they came from and why they are now on the run from the King of France. From various guests we learn bits and pieces of the story: a Brewster who knew Jeanne as a young child, a Butcher who lived in Jacob’s village, the Librarian from William’s monastery, a nun who is somehow able to fill in gaps of the story, and several others who encountered the group along their travels. There are stories of farting dragons, knights, feats of strength, miraculous healings, escapes, and betrayals. As the story moves along, it grows more and more fantastic. Could these tales really be true? Are these children really saints? Gidwitz has created a tale of epic proportions. Alternating narrators telling the stories of the three children keeps the book moving along quickly. And each character’s story only grows more incredible and adventure-filled as the novel progresses. Even the cursory characters, only there to briefly share their knowledge of the children, are interesting. 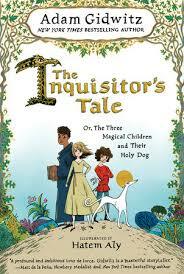 The Inquisitor’s Tale is an intricate story constantly in motion. 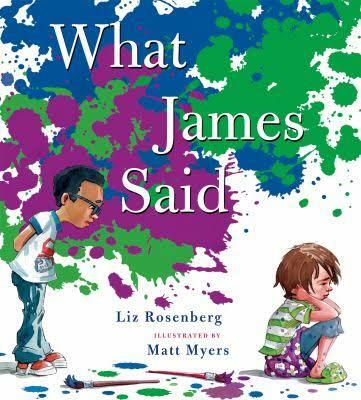 The language is a little complex, making it more suitable for middle school or advanced middle grade readers. Enthusiastically recommended for anyone who wants a book that will take them on an adventure. Before her mother dies, Emma makes a promise to her that she will do whatever it takes to fulfill her destiny. The “Wildflower” women of her family had only been doing just that since Revolutionary days, maybe even before then. You see, the women in Emma’s family were special and brave. They had been spies, musicians, journalists. And these bold destinies were revealed to all of the women in a dream. Emma feels almost certain that despite her heritage, she is not so special. And when her anxiously awaited dream finally occurs, she’s not sure she is up to the task. It appears to tell her she is supposed to discover a long buried treasure, rumored to be hidden in her small hometown. A treasure guarded by a cryptic song and an ancient ghost. A treasure that has claimed lives before hers. As if living up to her destiny dream weren’t enough, her beloved home is under threat. And she is determined to save the place where her family has lived for generations from destruction by a particularly ambitious outsider. Emma doesn’t want to let her mama down, but it seems like achieving her destiny may be beyond her reach. 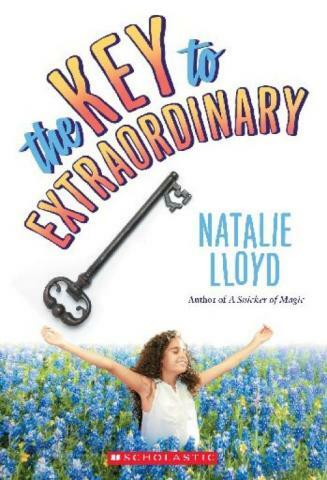 Natalie Lloyd has again successfully created a magical and absorbing book lead by a charming protagonist. Emma’s story is both complex and light-hearted. She has experienced real loss and sadness, yet she is still surrounded by love and friendship. Her story is fraught with hurdles, and though she views them as obstacles, she is not defeated by them. It is filled with characters who create music, and dance, and proffer friendship even in the face of difficult circumstances. As she did with A Snicker of Magic, Lloyd has created a story that will enchant readers who will be excitedly rooting for its characters. A highly-recommended read for anyone who loves a good book! You would think the ability to speak to magical creatures would be able to help get someone out of trouble; but in the case of Pip Bartlett, it does just the opposite. Career day at her school goes horribly wrong when Pip gets too involved with a group of boastful unicorns. As a result, she’s sent from her home in Atlanta, off to spend the summer with her Aunt Emma in small-town Georgia. Although seeing as how Emma is a veterinarian for magical creatures, it doesn’t prove to be much of a punishment. 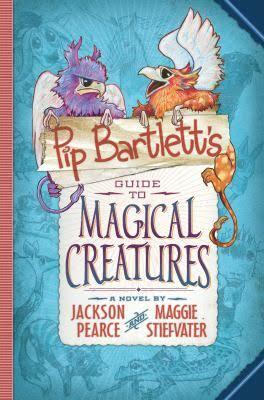 In fact it allows Pip the perfect opportunity to add updates in her favorite book, Jeffrey Higgleston’s Guide to Magical Creatures. The book details basic descriptions of most magical creatures, and when Pip encounters new creatures on her own, she fills in her personal updates. No one believes Pip can ACTUALLY talk to magical creatures. Not even her aunt. Her new friend Tomas isn’t sure either. But that doesn’t stop her. And to be quite frank, it comes in pretty handy when Aunt Emma’s town of Cloverton gets invaded by Fuzzles. Fuzzles are considered to be magical pests more so than animals. They catch on fire when agitated, and hide out in people’s underwear drawers. Needless to say, a Fuzzle infestation is a real problem for Cloverton. Pip, with some help from Tomas, may be the only one able to figure out why the Fuzzles are taking over the town and how to stop them, before an agent of the Supernatural/Magical Animal Care, Keeping, and Education Department (S.M.A.C.K.E.D.) eliminates the problem for good. Pip’s world is just like the real world, plus the existence of magical creatures. It is perfectly normal for someone to have a pet unicorn, or lilac-horned Pomeranian. And Pip’s love for animals is infectious. Tomas, who is allergic to everything (especially magical animals), even finds himself willing participating in Pip’s various animal-related hijinks. She is endlessly curious to learn more, and her conversations with animals are so natural for her, that you forget they are supposed to be out-of-the-ordinary. A highly-recommended fun and funny read for animal-lovers. Note: I really enjoyed listening to the audiobook version. It added to the conversations between Pip and the animals. However, if you do listen to the audiobook, I would also recommend picking up the physical book to check out the illustrations. Circumstances are not always as they seem. A little girl is upset to learn that her best friend James said she thinks she’s perfect. He told Aiden, and then his message made its way through several people before getting to her. She is devastated; she knows she’s not perfect. After that she spends the day ignoring James, who continues to be nothing but nice to her. As the day progresses, she grows more and more miserable about being mad at her best friend; but her feelings are too hurt for her to talk to him. At the art fair at the end of the day, she realizes that what she heard may not have been the message James actually delivered. Rosenberg, and illustrator Myers, perfectly capture the strong and confusing emotions of the story’s main character. She desperately misses her best friend, but he is so angry at him for his slight. Readers can see how such large emotions can be particularly difficult for little ones. She and James are both wonderfully expressive. And the young girl, who is an artist herself, uses her own work to edit images on the page reflecting her feelings. Myers also provides great illustrations depicting the organized chaos created by a large number of young children. A wonderful example of how important it is to slow down and try to understand a situation, rather than jumping to conclusions and creating unneeded frustration. Pete Collison is just a normal 12-year old growing up in Brooklyn in the 1950s. He cheers for the Brooklyn Dodgers, listens to mysteries on the radio, and plays punch ball with his friends. All of that changes after he takes a trip to the dentist during school one day. When Pete returns the next day, he learns that his teacher, Mr. Donovan, has told Pete’s entire class that Pete’s father is a communist, which means Pete is a communist. Pete is sure Mr. Donovan is wrong, but that doesn’t stop his teacher from treating him poorly, and his friends from leaving him out of their games. And soon a man from the FBI starts showing up to ask Pete questions about his father and his family. Pete is convinced he can use all of the skills he’s learned from his detective stories to figure out if his father is a communist, and who the “informer” is giving the FBI information about his family. He begins to grow suspicious of everyone: following members of his family, and trying to catch people in lies. But each time Pete thinks he has figured out the answers, he seems only to discover there are more secrets. Will Pete find out all of his family’s secrets and be able to rescue his father from getting in trouble with the US government for being a communist? Pete is a likable and admirable character. He stands up in the face of the discrimination he is receiving at school. He is not intimidated by his teacher, his classmates, or the FBI bullies. All he wants is to uncover the truth and protect his father. Even though he often feels alone and suspicious of others, he never becomes too overwhelmed to do what he thinks is right. An interesting historical fiction novel, Avi accurately captures the fear of time period, and makes it even more exciting by telling his story in a mystery format. Janine is not exactly like everyone else. And she is not afraid to be herself. From conversations with her imaginary friend, to her hairstyle, to her willingness to be kind to everyone, Janine stands out among the other students. Unfortunately, sometimes other children do not like that, and they may be unkind. When a classmate tries to exclude her from a party for being different, Janine just decides to have her own party and invite everyone. She does not let someone else’s disapproval get her down. In fact, she does such an extraordinary job of standing up for herself that everyone (except for the mean girl) wants to go to Janine’s party. Cocca-Leffler creates a lovable and quirky character in Janine. Readers immediately see the way she stands out with her patchwork clothes, unique hairstyle, and round-framed glasses. We also see how much fun she is always having: smiling, talking to her imaginary friend, singing on her own, and extending kindness toward others. She even seems happy when sticking up for herself to her bully. She is genuinely happy just being herself! A wonderful message, based on the actual experiences of the author/illustrator’s daughter, who is a fellow New Hampshire resident! Life has not been easy for the Eggers family. Ralph Eggers has been caring for his children, Tobias and Charlotte, on his own since losing his wife in a drowning accident. He cannot seem to keep a job; and his children’s pranks have been scaring away one nanny after another. This time, the Eggers children have gone too far. When Ralph Eggers returns home from a bad day to see his children laughing as their nanny, Martha, lies sprawled in the grass, something in him snaps. Tobias and Charlotte are commanded to get in the car as their father takes them for a long drive. At the end of it, he leaves them in front of Witherwood Reform School, out in the middle of nowhere, in the rain, and drives off. Mr. Eggers’ intentions were merely to scare his children; but as he is returning to pick them up he gets in an accident that leaves him with amnesia. The Eggers children, with nowhere else to go, venture into the strange and spooky school to get out of the night and the rain. Unfortunately for Charlotte and Tobias, their stay at the school becomes much longer than intended. And the longer they stay, the more they notice Witherwood is unlike any other place. Children and staff behave strangely. Students are not allowed out of their rooms at night. Class subjects are peculiar. Despite numerous attempts to escape, they find themselves repeatedly thwarted; stopped by strange animals and “well-meaning” adults. Without Ralph Eggers to remember he left them there, it seems as though they will never get out. The Eggers children are clever and persistent. Although they are devastated at the loss of their mother, and then by the thought that their father would leave them in such a terrible place, they will not give up trying to escape. Their cleverness and curiosity keep them searching for an escape even when things seem hopeless. And along their way they continue to come across interesting characters. Their persistence and genuine concern for other students will have readers rooting for them every step of the way. Fans of A Series of Unfortunate Events in search of a new series will enjoy Witherwood Reform School for its dark, slightly scary twists and turns. Readers will be anxiously awaiting the second book, because this one really leaves you hanging. As Winter approaches, Mama bear is preparing Maurice for hibernation. But all Maurice can think about is seeing his first Spring. When Mama falls asleep, Maurice goes out in search of Spring. He searches all over the forest, asking other animals preparing to hibernate where he can find it. During his search it begins to snow! This, Maurice thinks, must be Spring. So, he bundles some up to bring home. When he finally awakes from hibernating, his snowball has vanished. Devastated, Maurice brings everyone along in search of Spring once again. Only, this time he really finds it! A sweet story enhanced by Berger’s always lovely, cut-paper, collage illustrations. She creates detailed and adorable animals, green forests, magical snowflakes, and vibrant flowers. All of these beautifully construct Maurice’s journey. Berger does a remarkable job creating a world full of beauty, wonder and excitement. A perfect embodiment of the excitement the impending Spring brings (especially when you live in New England)! In many ways Audrey is a cow just like any other; grazing her days away on Bittersweet Farm with her fellow animals. But really she’s so much more than that. Audrey has the heart of a poet, a gift she most certainly got from her mother. She is able to see the beauty in every clover of grass, the clouds, and most importantly freedom. Audrey’s happy outlook on life is clouded once she finds out the role she and her mother have on Bittersweet Farm. Madge, her fellow cow, informs her that there are three types of cows on the farm: work cows, milk cows, and meat cows. Unfortunately for Audrey and her mother, they are meat cows. Not long after Audrey learns this distressing news, her mother is taken to “Abbot’s War” where all meat cows go. Before she leaves, she plants an idea in Audrey’s head: Audrey can escape her fate as a meat cow. Audrey is a cow so fascinating she captures the attention of both animals and humans alike. Her “story” is told by Audrey, as well as all of the other characters in the novel – taking on the style of subjects answering interview questions. This allows readers to see everyone’s role in Audrey’s escape tale. It gives the book the urgent feel of a news story, which we see Audrey’s escape becomes. Readers who enjoy animal stories will love Audrey (Cow). The main character is sweet and optimistic despite facing terrible circumstances. And she is supported by a cast of other charming farm animals. If you liked Charlotte’s Web, you’ll like Audrey (Cow). What wouldn’t you do to get your baby to sleep? The whole farm has been silently and anxiously waiting for the new egg to crack. Much to everyone’s delight, Baby Duck finally emerges. Now that he’s here, all Baby Duck wants to do is play and peep. All the other animals want to do is sleep. All of the animals take a turn trying a new trick to get him to drift off. As everyone’s eyes droop, Baby Duck just continues to peep, peep, peep until Duck attempts a tried-and-true method for babies everywhere: a drive. The animals are all happy with the results, but the farmer is less than pleased. Lewin’s smudgy illustrations perfectly capture the various feelings of farmer and farm animals. Readers can clearly read the excitement on the animals’ faces as they wait for Baby Duck’s arrival. Baby Duck is adorably silly. And the exhaustion everyone feels when sleep deprivation sets in is something every parents will notice. And the desperation to get the little one to sleep by any means necessary is something moms and dads can perfectly understand. A sweet, and comical family tale. Sammy Hayes-Rodriguez considers his sister, Maddie, to be his 1st best friend (his friend Trip is his 2nd best friend). His new brother “E” is a different story however. That’s because “E” (his mom says it stands for Egghead, Sammy thinks it stand for Error) is a robot. House of Robots seamlessly combines the silly and the serious. 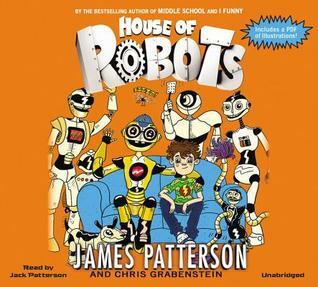 The Hayes-Rodriguez home is comically filled with robots of different “personalities,” some of whom are responsible for protecting Sammy’s sister. Maddie suffers from an immune deficiency syndrome that keeps her homebound and in need of a mostly sterile environment. “E” entertains students with jokes and tricks he’s memorized, but he also defends kids from Cooper Elliot, the school bully. Sammy, while behaving perhaps a little selfishly in his initial rejection of “E” is really a compassionate and thoughtful character. Perfect for readers stepping up from the Diary of a Wimpy Kid novels, with its denser text and occasional sketch illustrations. Also recommended for lovers of robots, science, and mystery. Titch, the guinea pig, has been waiting expectantly at the pet store for his “big person” to find him. He’s constantly trying to impress customers so they will buy him, but they always choose another guinea pig instead. Finally Bruno comes in, and he brings Titch home. Titch is so happy to have a home, but he isn’t so sure about some of Bruno’s habits. Bruno eats funny foods, and plays games that are too fast and too bouncy. When Bruno seems to be preoccupied with another activity though, Titch is worried that Bruno no longer wants him. Instead we see that as the two friends have gotten to know one another, Bruno has simply learned how Titch likes to play best. Dempsey succeeds in depicting the enthusiasm of a young boy excitedly playing with (aka torturing) his favorite new pet. Illustrations perfectly convey Titch’s many emotions: his disappointment at being rejected, his enthusiasm at being chosen, and his trepidation in his involvement with some of Bruno’s games. 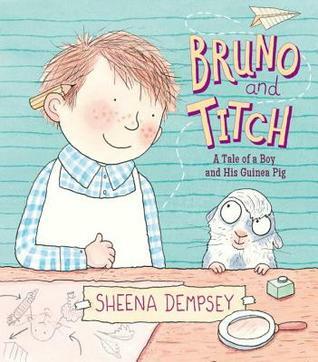 In Bruno we see a unique and creative boy, who wears a colander as a hat, actively engages his imagination, and likes to create new methods and structures of play. And while his enthusiasm seems to have him running wild, we learn that Bruno is observing the wants and needs of his new friend. Fin and Marrill are from two totally different worlds, literally, and yet they discover a first friend in each other while searching for home along the Pirate Stream. Fin is an orphan who grew up in the Khaznot Quay, a dangerous trading port along the Pirate Stream. Despite his young age, Fin is a master thief thanks to a unique ability to be forgotten by everyone who encounters him. One minute he's being chased by one of his victims, the next he ducks into an alley and they have forgotten who he is entirely. The only people who have ever remembered him at all are Mrs. Parsnickle at the orphanage (and she forgot him once he passed the age of seven), and his mother. But Fin's memory of his mother is brief, as she left him when he was very little. Marrill is temporarily living with her parents in Arizona. She hates it there. Her parents work all over the world, and they bring Marrill with them. She loves the adventure a new place brings. In fact, Marrill has already picked out their next destination, The Banton Park Live-In animal Rescue Reserve and Playround Fortress. If there's anything Marrill loves as much as a new adventure, its rescuing animals in need. Unfortunately they won't be going anywhere, because her mother is sick. Both fleeing from unfortunate circumstances: Fin running from a new theft victim who actually remembers him, and who is scarier than anyone he has encountered, Marrill devastated about her mother's illness, and who actually remembers Fin even after he leaves her sight; the two find themselves on an adventure aboard the Enterprising Kraken. Joining up with a wizard named Ardent and the ship's captain, Coll, the unlikely pair set sail on the Pirate Stream, weaving in and out of magical places in search of the Map to Everywhere. Once they find it Fin can use it to locate the mother who will certainly remember him, and Marrill can return home to her parents. The Map to Everywhere is a nonstop magical adventure. The story is filled with interesting characters, and imaginative places: wizards, human-animal hybrids, pirates, rumor-spreading trees, and crooked towers made of ice. Fin and Marrill are two kids who have lived lives filled with adventure, but who have uncovered even more fun in finding a best friend. Even though the story's characters are all searching for someplace else, they have loads of fun on their journey together. As the first book of a new series, there promises to be a lot more fun-filled action in store. Highly recommended for lovers of adventure, magic, and stories about friendship! Browne's protagonist, Joe, is on his way to his first big party and he's worried. So many things could go wrong. There could be people there who aren't nice, food he doesn't like, or games he won't want to play. Thankfully he has his mother to reassure him as they make their way to Joe's friend Tom's house. Once they arrive, Joe sees there is nothing to fear. After they part ways, it is mom's turn to worry on her way home. Browne perfectly depicts the fears of an anxious child. Readers can see the anxiety on Joe's face as he presents to his mother all of the possible things that could go wrong. As they discuss all of his worries, the images of mother and son are depicted in muted shades of blue, which stand in contrast to the richly colored illustrations of scenes in the homes they pass. And Joe's various fears show up in the images they see through the windows of houses along the way: people with horns and dinner tables littered with eyeballs and worms. Then once she has safely delivered Joe, the anxiety shows up on mom's face as she then worries that maybe all will not go as well as she has promised. Being almost 6 feet tall, and just 12 years old, with a name like Truly Lovejoy it’s hard to blend in, which is what Truly so desperately wants to do. And with a father in the military constantly making her the new girl in school, it’s only harder. All of that is going to change though. At last her family of seven is settling into a permanent home right down the street from her cousin and best friend. Finally things are going her way. Just when life seems perfect, tragedy strikes. Truly’s father, Lieutenant Colonel Jericho T. Lovejoy is injured while stationed overseas. He returns to the family’s new home in Texas unable to perform his jobs as pilot and wrestling coach. The solution? The Lieutenant Colonel will move his family to his hometown of Pumpkin Falls, NH where he will take over the family bookstore with his older sister (while his parents join the Peace Corps. and travel). Truly is devastated by having to move from Texas to New Hampshire in the middle of winter, to start at a new school. To make matters worse, her recent report card showed up at their Pumpkin Falls home, revealing a less-than-stellar math grade. Now she has to be tutored by her father at the bookstore every day after school, and help out with the store’s inventory. But when Truly thinks things can’t get any worse living in this small New Hampshire town, she uncovers a twenty year old Pumpkin Falls mystery hidden in the pages of an antique book. Her hunt to solve it will help her see all of the things her new home has to offer. Absolutely Truly is a fun mystery that showcases all of the wonderful reasons to love living in a small community in New Hampshire. It is mixed with the difficulties of being 12 years old, in a family of 5 children, forced to move all of the time; as well as the struggles of a family facing the reality of an injured veteran and financial struggles. Everyone can relate to Truly’s frustrations and mistakes. She is a likable character who is trying to find her place. While the mystery storyline doesn’t contain a lot of suspense, the resolution provides a fun surprise. I would recommend to readers who enjoy mysteries, realistic fiction, and stories about New Hampshire. 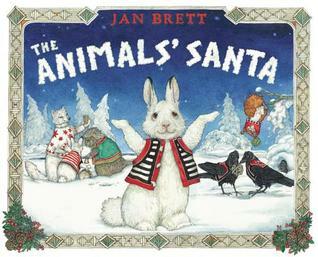 Brett’s woodland creatures are gathered together on snowy Christmas Eve telling tales of the animals’ Santa. It is Little Snow’s first Christmas, and he is skeptical about the stories other animals recount, since none of them has actually ever seen this Santa. As everyone shares gifts they have received, and theories of who the animals’ Santa could be, readers see chipmunks on the page edges busily readying gifts. In the end, Little Snow’s brother, Big Snowshoe, figures out a way to catch Santa as he is delivering the gifts; and all of the animals are surprised to discover who he is. As always, Brett masterfully creates a magical, snowy, woodland scene making even the prickliest animals look cuddly. Her rabbits, squirrels, ravens, fox, and porcupine are so detailed it seems you could reach out and pet them. 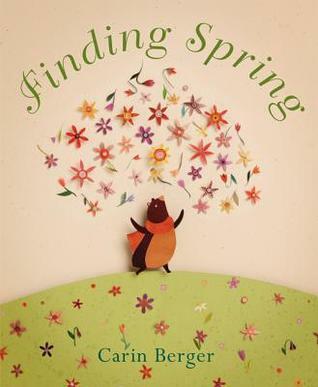 A sweet and cozy story that leaves readers feeling warm despite the chilly images on the page. Rose Howard is a fifth-grader at Hatford Elementary in upstate New York; and she loves homonyms. The more homonyms in a group, the better. For example, her name Rose has one homonym: rows; but she names her dog Rain because it belongs to a three homonym group: rain, rein, and reign; and that is good luck. She also likes rules and numbers, particularly prime numbers. When Rose feels overwhelmed she often counts off prime numbers; and she feels overwhelmed a lot. Rose has high-functioning autism, or Asperger’s. Her father, Wesley Howard, does not want to travel to bring Rose to a school that can provide her with specialized attention, so she has an aid to help her adjust to a normal classroom environment. She tries to relate to other students; asking questions like which direction do their houses face (hers faces Northeast), or sharing with them her discoveries of new homonyms. Unfortunately, other students don’t understand her love for homonyms, rules, and prime numbers. Often Rose’s aid has to help her calm down when other students mistakenly break classroom rules. On top of being isolated from her classmates, Rose’s father does not have much patience for her, and her mother left when she was little. Thankfully she has her Uncle Weldon who drives Rose to school and helps her find new homonyms, and her dog rain to keep her company. Rose and Rain have been inseparable (except for when Rose goes to school of course) since Rose’s dad brought the dog home, after finding it lost and without identification. They have a routine they stick to every day. Rose and Rain sit on the porch, take walks, eat dinner, and go to bed together. That is, until Rose’s dad lets Rain outside during Superstorm Susan. Rose wakes up the morning after a hurricane has severely damaged Hatford, to find that Rain is missing; and she was let outside without her collar. As Rose searches for her dog, she begins a journey that will change her life, and her understanding of others. Rain Reign is Rose’s account of what happened to her dog during Superstorm Susan. It gives an honest look at someone struggling with Asperger’s, and how difficult it can be to handle disruptions to her routine. However, even though Rose’s Asperger’s is an important part of the story, it is not the only important part of Rose’s story. Martin does an extraordinary job of giving Rose layers that make her relatable to most readers: the struggle to make friends when you’re different, difficulty with parents, and learning the importance of compassion. Rose is honest, and her forthrightness really gives readers an understanding of someone else’s perspective. I highly recommend this book for those who like realistic fiction, and animal stories. Mix it Up provides basic instructions that turn this visually simplistic picture book into an interactive art experiment. As with his previous works, Tullet prompts readers to tap, press, touch, and shake; and then turn the page to see the result of their work. With this book, he shows how colors can combine to create something new; and as things progress he encourages the reader to guess what the next combination will make. Tullet sets his dots, streaks, and blobs of color (which look like actual smears of paint) against a white background. the blank canvas highlights the vibrant colors, and the changes that new combinations make on each page. A simple, silly book sure to have children looking to dip their fingers in some paint! Evelyn Ronan Truelove (do not call him Evelyn!) is the busiest kid he knows. His mom makes sure of it. She is constantly enrolling him in after school activities: karate, ultimate frisbee, gymnastics, and fencing- to name a few. Soon Ronan learns his mother has a reason for keeping him so busy. She belongs to an organization called the Blood Guard, which protects the lives of people with Pure souls from those seeking to harm them. Ronan is being prepared for the day when he too might join. Unfortunately, he will have to use the skills he's learned earlier than expected when he and his mother find themselves pursued by a terrifying group of would-be kidnappers. At the story's beginning Ronan is picked up by his mother, Bree, who informs him that his father is missing, their home has been ransacked, and they are being chased. She sends Ronan away with a Blood Guard Overseer named Jack Dawkins to keep him safe; only for Ronan to discover that he is the one being chased! Ronan, his friend Greta (who he bumps into on a train), and Dawkins encounter one obstacle after another on their way to finding Ronan's mom, and figuring out why a group of mysterious individuals would be chasing him. As he is being chased Ronan realizes that maybe he has skills that he has never trained for. How can he run so fast? Or see things in slow motion? Eventually, Ronan gets closer to his family, the truth about the Blood Guard and its enemies, and surprises he wold never have guessed! Even though The Blood Guard is the first book in a trilogy, the main problems Ronan faces in the book are resolved by its end. However, it will leave you curious about what challenges he will face next, since evil obviously cannot be defeated so easily! As Ronan tries to lose the people chasing him, he learns a lot about himself. When fighting off his kidnappers, he realizes that he is capable of bravery, and that he possesses skills he had never dreamed of. Ronan is likeable, earnest, and self-aware. I highly recommend this book to anyone looking for a fun, action-packed story with some mystery and fantasy thrown in. While we think our toddlers are resting safely in their beds, they are sneaking out for a parade under the stars. Roscoe imagines a world where children march through empty streets, play in the park, and bake cupcakes under a smiling moon. With the turn of each page, Roscoe's rhythmic text dances us through another activity, as the children slowly wear themselves out and eventually return home to sleep. Walker's illustrations are colorful and vibrant. His details reveal those things we love most about toddlers: toes sticking out of blankets, belly buttons peeking out of pajamas, and sleepy faces. An adorable, rhyming tale to lull little ones to sleep. Having made only one friend in her new school, and with all of her lifelong friends over a thousand miles away, Audrey is feeling pretty lonely in the White House. Her mother (aka Madame President) is constantly traveling or in meetings. Her father is either in his lab doing research or fulfilling his duties as First Gent. As she is wallowing in her loneliness, Audrey stumbles upon a diary kept by Alice Roosevelt that had been hidden in a closet. She finds comfort reading about Alice’s frustration in being stifled as the President’s daughter; and enjoys tales of the trouble Alice caused in trying to break free of the rules. The diary inspires Audrey to recapture some of the freedom she enjoyed before life in the White House. She adopts the mantra What Would Alice Do (WWAD) to guide her when faced with obstacles. Unfortunately, in trying to follow Alice’s lead, Audrey only finds herself getting into trouble with antics like accidentally crashing a golf cart she rides out of bounds on the White House lawn. She doesn’t mean to cause trouble, she just wants the freedom to be herself! When things are at their worst, Audrey receives advice from her favorite pastry chef that helps her find her voice and her place in her new role. When Audrey Met Alice is a fun historical fiction novel. It rolls two stories into one, allowing readers to enjoy a peek inside the White House as experienced by fictional Audrey; as well as using Alice Roosevelt’s diary to share some stories about the famous, former First Daughter. Audrey’s frustration is realistic and relatable. Who wouldn’t be frustrated at having to jump through hoops to have your friends over, dealing with parents who are always too busy, and having the Secret Service watching every time you talk to your crush?! Not to mention any mistake you make will be published in newspapers for everyone to see. However, Audrey and Alice learn it is best to be honest with your parents about your frustrations, and honest with yourself about who you want to be. While it is not full of important historical information or dates, the tales of Alice Roosevelt are a fun and interesting read that incorporate facts from her real life. The author also includes resources for additional information on Alice for interested readers. Wood’s book shows readers all the ways a grandpa may “say” I love you without actually uttering those three words. Each page depicts various animals: bears, frogs, pigs, rabbits, elephants, etc., in pairs as grandpa and grandchild. With each pair we see a way in which grandpa shows his grandchild how he loves him or her. Grandpa might show you how to tie your shoes, buy you an ice cream cone, or join your tea party. Bell’s illustrations are soft and smudgy, portraying a feeling of warmth with each scene. Pages alternate between full-bleed illustrations, and images set against a white background, giving each grandpa’s story a unique feel. A cozy and comforting story – just like grandpa!